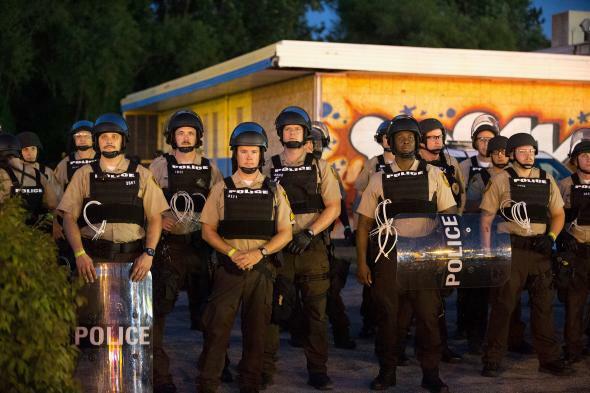 Justice Department sues the city of Ferguson for reneging on police reform deal. Police stand guard as demonstrators, marking the one-year anniversary of the shooting of Michael Brown on August 10, 2015 in Ferguson, Missouri. The DOJ opened its civil rights investigation into the policing of Ferguson following the 2014 shooting death of Michael Brown and uncovered a police force and court system that operated outside the law, in a fashion that showed a deep bias against its black residents, while simultaneously functioning as a revenue-generator for the local government. To avoid a federal lawsuit, the Obama administration spent seven months negotiating reforms and came to an agreement on a package of fundamental changes last month. They agreed that police officers would not make arrests without probable cause, shoot at moving cars or use stun guns as punishment. The agreement demanded that the municipal court be independent of the Police Department, and called for the repeal of some laws, like a vague jaywalking ordinance that was used almost exclusively against black residents. It was an expensive deal. It called for Ferguson to pay for an independent monitor, provide new training and give raises to police officers in order to attract qualified applicants. Ferguson has been running an operating deficit of about $2.5 million since the unrest of a year and a half ago, but Mayor James Knowles III said he was optimistic that he had the votes in the City Council to approve the agreement. Opposition to the agreement was largely financial, with concerns over the cost of the deal looming large for the council and some residents.